The weather for the past year has been a great disappointment. The summer was long and extremely hazy. The winter, late as it arrived, already seems like a thing of the past. The past week has seen rising temperatures and unpredictable days. Yesterday evening was one of those unpredictable ones. The day was cool but nothing extraordinary. Suddenly by about 3:30 PM a thick fog blew in from the sea and quickly engulfed the city. I got my camera kit and raced to the corniche (road on the beach) to capture a few shots of the city shrouded in the fog. I actually wanted to capture the sun’s rays bouncing off a glass-faced building as the fog thinned out. The sun was setting and the fog didn’t look like passing. It was then, while I was waiting, that I turned my attention to the road and started shooting a few snaps of the cars that were whizzing past. I tried to pan a few shots and got lucky. 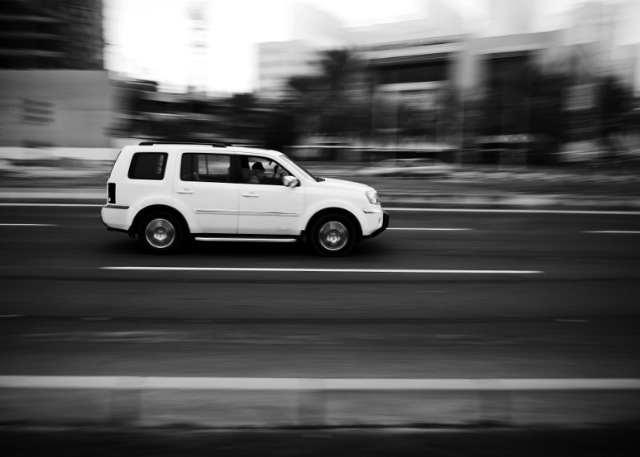 This shot is that of a Honda Pilot cruising at 80 kmph (the speed limit). I am glad you like the pic, Martin.